Community Actions Call on Wakefern Food Cooperation to Provide Better Wages & Better Benefits to all Price Rite Workers. Today, the United Food and Commercial Workers International Union (UFCW), Jobs with Justice, and community partners from across our jurisdiction are launching the next phase of their “Change Price Rite Supermarkets for the Better” campaign aimed at Wakefern Food Cooperation’s Price Rite grocery store brand. The Price Rite campaign is part of national and regional effort to highlight local and national irresponsible employers who must take specific actions to change the lives of the hard-working employees for the better. The “Change Price Rite for the Better” campaign will continue Tuesday with public actions across six states and nearly 40 cities, and will involve hundreds of local community leaders and partners from the UFCW, Jobs with Justice, and local retail workers. “Price Rite can and should do better. It must change. It has the power to change. And, with the support of the community and customers, the hard-working men and women of Price Rite can earn a better life and better wages. 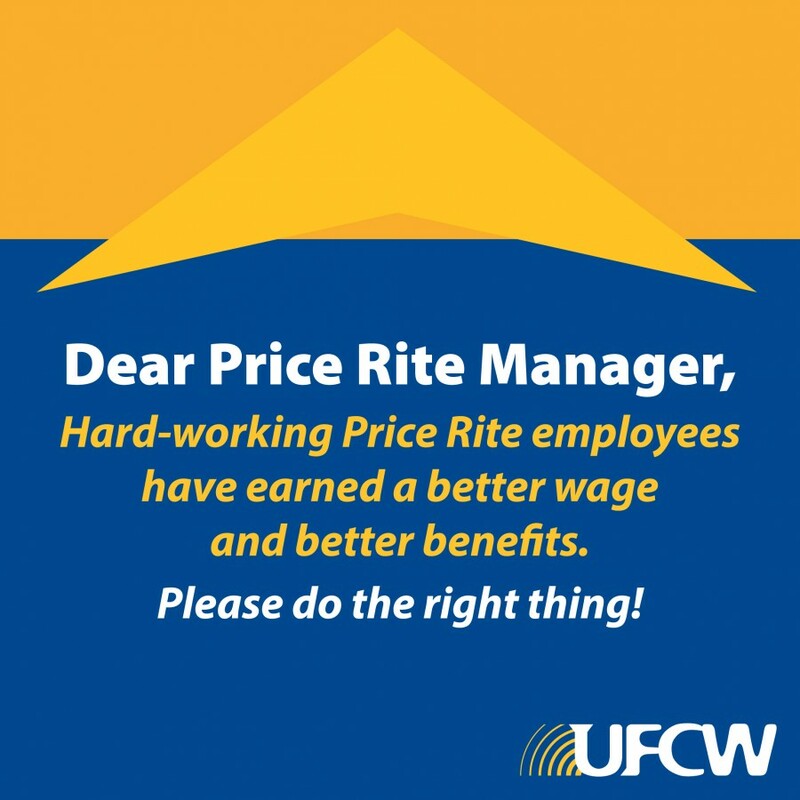 That is what this campaign is all about – joining together to make Price Rite better for its employees and the community,” said Tom Clarke, UFCW Region 1. The current phase of the “Change Price Rite for the Better” campaign will involve a series of coordinated public actions, as well as targeted social media effort, that will reach out to educate and mobilize thousands of Price Rite customers to support Price Rite employees’ efforts to better their lives. During this week’s actions, customers will deliver a message to Price Rite managers that will call on the company to “do what is right” and provide better wages, better benefits, and better scheduling for their Price Rite employees. “I have worked at Price Rite for over five years. I work hard to support my family, and am proud to serve our customers and the community. Despite my dedication, my commitment, and hard work, I am unable to get full-time hours and earn enough to support my family. Our sincere message to Price Rite is that they must do better. We’re asking them to do what is right because now is the time to change,” said a current Price Rite worker. Price Rite runs 58 stores across eight states and employs thousands of hard-working men and women. Among the many issues affecting many of the workers in the area are low wages, inconsistent scheduling, unpaid sick leave, and other poor employment practices proliferated by stores like Price Rite. The campaign to “Change Price Rite for the Better” is part of regional and national effort to highlight the need for retail companies, like Price Rite, to pay the hard-working men and women better wages, provide better benefits, offer consistent scheduling, and respect on the job. For more information about the worker campaign and upcoming actions, contact the UFCW press team at 202-466-1591 or press@ufcw.org.